INDEVCO Group introduces the Spanish chemical and petrochemical packaging portal providing sector related information, product specifications, news, and photos. 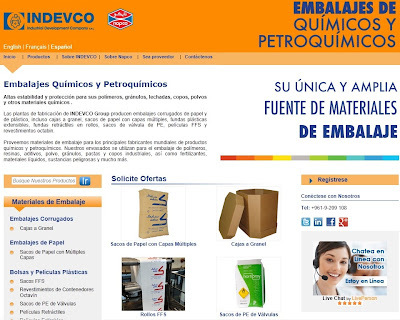 INDEVCO Spanish chemical and petrochemical packaging portal displays product-detailed information with a large variety of high-resolution vivid product images for Spanish speakers. The portal allows visitors to gather information about corrugated, paper and plastic packaging materials, including bulk bins, multi-wall paper sacks (MWS), stretch hood films, shrink hood films, PE valve bags, form fill seal (FFS) films and octabin liners. in-depth product information and detailed specifications about products and download relevant brochures. Visitors, through the Spanish chemical and petrochemical packaging portal, can follow all social media channels such as Facebook, LinkedIn, YouTube and Twitter. Interested parties can also subscribe to INDEVCO’s OUTBOUND e-newsletter to access sector, company, and product related news, as well as be informed of all upcoming events.